Journalism is a major source of gathering information that gets distributed to the public. There have been many different kinds of journalism throughout the years, which include photojournalism, investigative journalism, news journalism, etc. But what is the core of journalism? Is this so easily determined in today’s society, where there is a surplus of different types of distributed information? Is all of this distributed information truly journalism? How much has journalism has changed since its beginning? When was its beginning? These questions might be answered more easily than you imagine. The first form of journalism-believe it or not-was actually discovered to be in Ancient Rome under the name Acta Diurna, which translates to ‘newspaper’ from Latin. It was before 59 BCE that this news sheet circulated the ancient city and enlightened all those that read it. It listed many things that would happen throughout the day, which included important daily events like public speeches. While this established the basis of journalism, there typically weren’t more than a few copies at any given time. The audience for journalism was primarily the learned and the elite. It wouldn’t be until 1609 in German cities that the first regularly published, widely distributed newspapers appeared—owing to the invention of the printing press. We can safely assume that like their Roman predecessors, these papers communicated important information that would benefit the public. However, unlike the previous iterations of the news, these papers were available to a broad public audience. Journalism in itself has experienced a shift in the last 40 years. Back in 1978, you would see a large room filled with typewriters, journalists clicking away at their typewriters alongside cigarettes and ashtrays accompanied by cups upon cups of coffee. Nowadays, many journalistic offices are filled with computers and other technological innovations. Today’s journalism is produced with many technological innovations that make getting stories out to the masses much more quickly and easily. With one press of a button, a single story can be put on the internet for thousands upon thousands of people to see. Well-known newspapers like The New York Times might even get hundreds of thousands of readers just from one digital article. The irony of the situation is that pretty much anyone with a computer and internet service can publish content that millions of people can consume. Anyone can generate an audience without fact-checking, without verification of any kind. This, along with many other factors, has warped journalism from its previous form into what it is now. It now resembles the “yellow journalism” of the 1890s, pandering to the pubic’s taste for sensational topics and slanted political reporting that aims more to perpetuate ideological viewpoints with loaded, emotional language than to inform readers with objective facts on any given issue. “Clickbait” has become a popular trend. Clickbait is the practice of playing to readers’ emotions by creating sensationalized headlines in order to gain greater exposure from people clicking the article more. Many online media outlets use this technique, despite many people’s discontent with the practice. For a period of time after “yellow journalism” but before “clickbait”, journalism became a very honorable and honest trade that most journalists viewed as more of a public service rather than a way to make money quickly. Along with new technological innovations, the overall way of gaining knowledge through journalism has changed. Nowadays there is no longer a singular big news source, but through search engines like Google and Bing, the journalism is more focused on the overall collection of information. Instead of reporting on one thing at a time, many companies that include journalism end up having multiple people research and write for their company, sometimes resulting in confused readers for people who are unfamiliar with the views of said company as a whole, rather than the individual writer. The ups outweigh the downs, however, as ultimately more information is conveyed by multiple news outlets. Alongside “clickbait”, nowadays there is a surplus of fake news that stems from media concentration. Media Concentration is the act of a much larger company acquiring smaller individual companies in their respective industry and converting them into another source of broadcasting the original media the parent company has produced to their certain audience. This not only broadcasts the biased news the outlet is creating to the public, but it is also limiting the amount of different viewpoints on a specific topic by reducing it’s own competition through the acquisition of smaller companies, consequently reducing the overall information to that specific area or audience that is receiving the information. Another similarity to clickbait is the pandering to certain audiences by the media. The pandering usually takes the form of articles that are written with a firm bias towards a certain viewpoint. The most common articles that hold these biases are usually those of a political nature, who can easily get consumers to view their news by either pandering to liberals or conservatives. This often results in a warped perspective of the information given, and typically results in the production of uninformative or factually incomplete news. 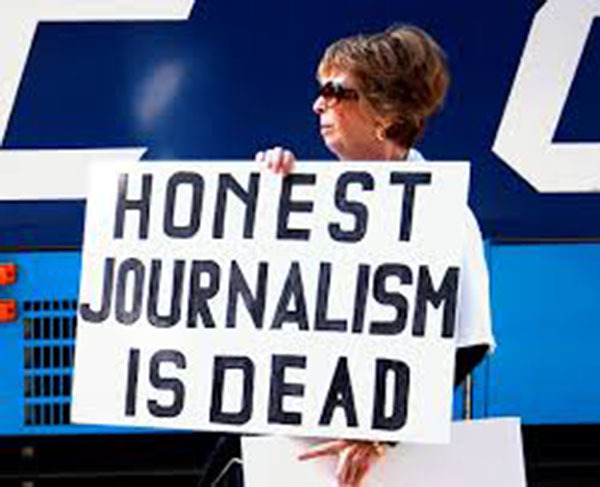 Ultimately, journalism has changed fundamentally due to the ready availability of equipment and channels of distribution that enable not only trained journalists—but pretty much anyone—to publish content that is available to consumers worldwide without checks and balances to help ensure objectivity, quality, and integrity of the content. In democratically governed nations that value freedom of speech, there are no widely agreed-upon standards guiding nor governing what gets published. Whether these changes are for better or worse is left up to every individual’s interpretation.